Hear Again Music and Movies has resided in downtown Gainesville since owner Andrew Schaer moved the store in 2009. The storefront, with its windows covered in album art, foreshadows what passersby will see inside: more than 7,000 records ranging from Etta James and Leonard Cohen to Taylor Swift and Sonic Youth, and every genre in between. 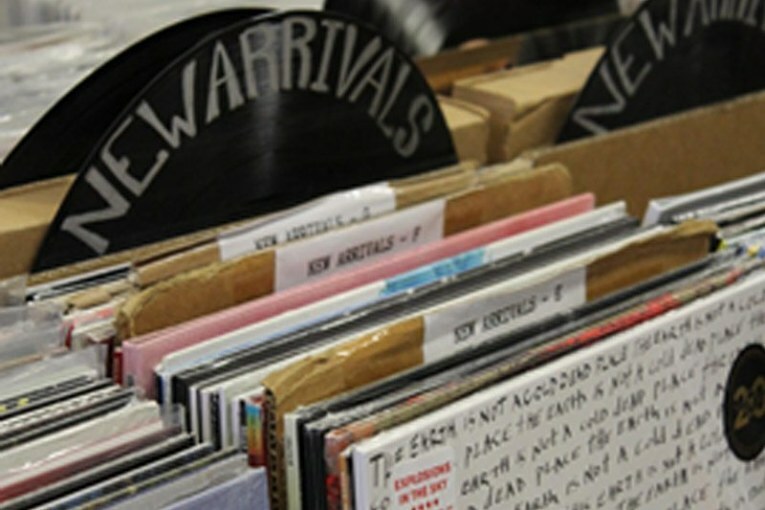 The store offers a wide variety of records and stays open late to attract restaurant-goers and those taking advantage of the cooler evening air. Along with the store’s strategic location, Hear Again also utilizes social media platforms, mostly Instagram and Facebook, to effectively market its principal product. Schaer began his marketing endeavor by posting lists of the store’s new vinyl inventory on Facebook, but he quickly realized that his page would perform better using visual aspects. “Pictures just made all the difference in the world because that’s what makes you stop and look,” he said. Schaer observed that his Facebook posts were becoming lost in feeds, so he consequently switched to Instagram as his preferred marketing platform. Schaer still maintains the store’s Facebook account, but it serves to primarily show restocks whereas the Instagram account features new releases. Schaer noted how avid followers of Hear Again’s social media accounts have shown up to the store for a new product within minutes of a posting, thus reinforcing his belief in the power of social media for promoting his business. When it comes to attracting new customers, Hear Again largely relies on word of mouth and posting to flier boards around campus. While many local Gainesville vinyl fans already know about his store, Schaer also makes an effort to reach out to new students enrolling at the University of Florida each semester. When asked about competition from online vendors like Amazon, Schaer said Hear Again sets itself apart by focusing on satisfying client needs that online stores cannot. Namely, the desire for instant gratification and quality assurance.